…a well-established contemporary dance form possessing a discernable set of characteristics, practices and conventions. The genre is also considered as a distinct form of dance practice that, through its engagement with everyday rural and urban environments presents opportunities to explore space, place and environment through corporeal means (p.2). To demonstrate the breadth and depth of the collection, across four of the five sections above (the first three and the latter one), foci of chapters include Derek McCormack’s concern with air and atmosphere and moving bodies and Camilla Damkjaer’s theorising of performing ‘Homemade Circus’ in academic environments. Further examples include Melanie Kloetzel’s reflection of the performance work The Sanitisers (2011) in the Calgary Skywalk System in the context of spectator reception, and Cheryl Stock’s recounting of the artistic collaborative processes involved in the performance of Naik Naik (2013) in Melaka, Malaysia. One of the strongest sections of the book with a focus that resonates as particularly topical is that entitled ‘Environmental and rural practice’ concerned broadly with ‘environmental dance’ (Sarco-Thomas, p.354). Chapters here include Malaika Sarco-Thomas’s concern with ‘intersubjective understandings and kinaesthetic imaginings’ (p.343) framed by the ecologies of Félix Guattari in inspiring empathy with the environment and Nigel Stewart’s application of epistemes to understanding corporeal responses to participating in site-specific dance. Both chapters and the section as a whole highlight the rapidly changing and ever evolving nature of site-specific dance in reflecting greater ecological concerns. space for a range of ‘voices’ to appear in a number of ways from the subjective and (often) autobiographical registers of artist-practitioners for whom experiences of body-site and self are interwoven to the analytical and objective chapters presented by academics and theoreticians (p.4). This is particularly important when noting the propensity for the same key theorists (including performance theorists Valerie Briginshaw and Valerie Preston-Dunlop and philosophers [broadly speaking] Henri Lefebvre, Maurice Merleau-Ponty, Gilles Deleuze, Félix Guattari, Michel de Certeau) to be drawn upon and cited throughout the text. Although this repetition serves to highlight (to the student reader in particular) those landmark sources and theories that have influenced the development of site-specific dance scholarship, it also reveals a need to continue pushing the boundaries of exploration. This body of work exemplifies the latter action. Chapters that contribute original intradisciplinary theories and concepts include Hunter’s ‘model of influence’, framing the relationship between the creative and choreographic process and the location of performance, and Sandra Reeve’s proposal of ‘ecological movement dynamics’ to site-specific dance performance. Site-specific dance performance may have grown from—and continue to be closely entwined with—interdisciplinarity but this anthology illustrates a cementing of intradisciplinary identity through a formalist approach as entwining scholarship and practice grow. As Hunter highlights, although ‘there is evidence of artistic research and development being conducted by practitioners… the knowledge often remains tacit and contained within the field of professional practice’ (p.3). The interweaving of chapters written by academics and practitioners is particularly effective and a number of chapters are co-authored by authors adopting differing roles or sharing both roles (for example, Fiona Wilkie’s chapter ‘Sited conversation’ is informed by conversations with practitioners Carolyn Deby and Stephen Hodge of companies sirenscrossing and Wrights & Sites respectively). However, although a key aim of the book is to ‘consider how particular theoretical ideas might contribute to the development of a broader, more fluid understanding of site-specific dance performance’ (p.12), some chapters’ connections to site-specific dance are rather tenuous. In particular, Jen Southern and Chris Speed’s chapter on apps, while interesting, would appear better placed in an anthology that looked more broadly at the concept of human movement, rather than one that featured the term ‘dance’. Southern and Speed consider how the Combo Net app, originally devised for an arts context, was used by one family ‘to enhance their sense of connectedness whilst at a distance, mediating absences and presences in a highly mobile familial group’ (p.131). Certainly attention is paid to ‘movement patterns’ and temporal presence, but greater attention is centered on social interaction from afar through digital means. A second example of a chapter that does not ‘fit’ particularly well is Jean Johnson-Jones’s account of the Nama Stap Dance performed by the Nama in Namaqualand, situated in north-west South Africa. While of valued significance from an anthropological perspective, it is difficult to see how this chapter overtly links to a focus on the site-specific. Unsurprisingly, with such a rich and diverse collection of chapters, some works will prove to be of more significance than others to the individual reader. However, with the balance of histories and trajectories presented (most notably Hunter’s tracing of the development of site-specific dance performance in the Introduction), the drawing upon of key architectural, dance, ecological, philosophical and spatial theorists, and the sheer range of foci adopted by individual authors, this is a work that overall has to appeal to both student and scholar. 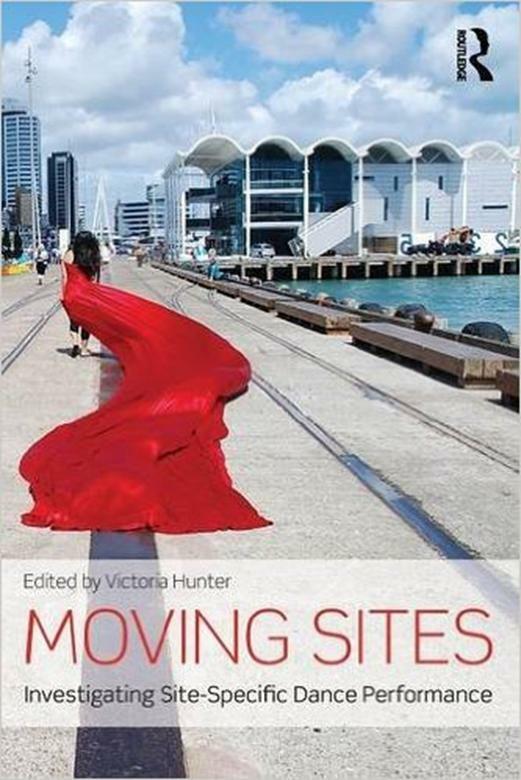 Moving sites: investigating site-specific dance performance is a weighty tome of an anthology that the genre has been deservedly waiting for, and one that should prove a pivotal source in continued debates and discussions revolving around the performance of performance outwith ‘traditional’ places and spaces. Bethany Whiteside is completing an ESRC CASE Studentship, supported by Capacity Building Cluster ‘Capitalising on Creativity’ grant #RES 187-24-001 in the sociology of participatory dance. In 2014, she was a Visiting Research Scholar at Temple University Dance Department, funded by the ESRC as an Overseas Institutional Visit and was a founding Co-editor of the Scottish Journal of Performance.